We’ve operated a few cruises since our last report, and though our sighting success has been a bit of a mixed bag, we did have a lot of fun. On Monday’s Mid-Morning Whale Watch we cruised around for over an hour before we finally saw a spout. We headed to the area where we saw it and were rewarded with 3 separate sightings of that Humpback. We just couldn’t bear to leave this whale, and ended up staying out on the water an extra 30 minutes (and those of us who were at the bow got a great view of the whale as he sounded that 3rd time). Oh…and we got a chance to deploy our hydrophone during this trip. We heard some very quiet singing…but it was definitely a Humpback we were listening to! 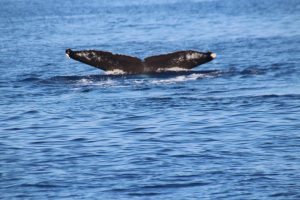 Unfortunately, the Humpbacks were hiding for our Tuesday Wake up with the Whales Cruise, so we called the trip a “Fluke” and everyone aboard has been invited back to try again with us for FREE! Ocean Sports Whale Fact of the Day: Monday’s Fact of the Day referenced the number of whale species documented in Hawaiian waters..and that inspired one of our readers to ask us how many total whale species there are in the world. Interestingly, researchers don’t agree on the number because species’ classifications are still a bit controversial. Saying that, we’ll defer to the Society for Marine Mammalogy (the largest international association of marine mammal scientists in the world) — they list a total of 14 species of Baleen Whales (suborder ”Mysticete”), and 72 species of Toothed Whales (suborder “Odontocete).